A team of Massachusetts General Hospital (MGH) investigators has made the first steps towards developing bioartificial replacement limbs suitable for transplantation. 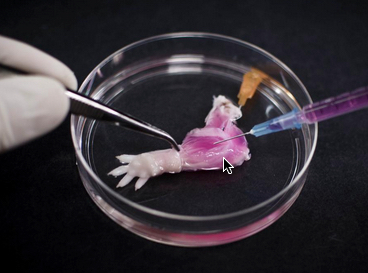 In a Biomaterials journal report, the researchers describe using an experimental approach previously used to build bioartificial organs to engineer rat forelimbs with functioning vascular and muscle tissue. They also provided evidence that the same approach could be applied to the limbs of primates. “The composite nature of our limbs makes building a functional biological replacement particularly challenging,” explains Harald Ott, MD, of the MGH Department of Surgery and the Center for Regenerative Medicine and assistant professor of Surgery at Harvard Medical School, senior author of the paper. The progenitor cells needed to regenerate all of the tissues that make up a limb could be provided by the potential recipient. The problem is that limbs contain muscles, bone, cartilage, blood vessels, tendons, ligaments and nerves — each of which has to be rebuilt and requires a specific supporting structure (“matrix”), a step that has been a missing, he explained. The current study uses technology Ott discovered as a research fellow at the University of Minnesota, in which living cells are stripped from a donor organ with a detergent solution and the remaining matrix is then repopulated with progenitor cells appropriate to the specific organ. His team and others at MGH and elsewhere have used this decellularization technique to regenerate kidneys, livers, hearts, and lungs from animal models, but this is the first reported use to engineer the more complex tissues of a bioartificial limb. The same decellularization process used in the whole-organ studies — perfusing a detergent solution through the vascular system — was used to strip all cellular materials from forelimbs removed from deceased rats in a way that preserved the primary vasculature and nerve matrix. After thorough removal of cellular debris — a process that took a week — what remained was the cell-free matrix that provides structure to all of a limb’s composite tissues. At the same time, populations of muscle and vascular cells were being grown in culture. The research team then cultured the forelimb matrix in a bioreactor, within which vascular cells were injected into the limb’s main artery to regenerate veins and arteries. Muscle progenitors were injected directly into the matrix sheaths that define the position of each muscle. 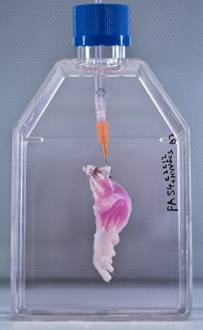 After five days in culture, electrical stimulation was applied to the potential limb graft to further promote muscle formation, and after two weeks, the grafts were removed from the bioreactor. Analysis of the bioartificial limbs confirmed the presence of vascular cells along blood vessel walls and muscle cells aligned into appropriate fibers throughout the muscle matrix. Functional testing of the isolated limbs showed that electrical stimulation of muscle fibers caused them to contract with a strength 80 percent of what would be seen in newborn animals. The vascular systems of bioengineered forelimbs transplanted into recipient animals quickly filled with blood, which continued to circulate, and electrical stimulation of muscles within transplanted grafts flexed the wrists and digital joints of the animals’ paws. The research team also successfully decellularized baboon forearms to confirm the feasibility of using this approach on the scale that would be required for human patients. Ott notes that, while regrowing nerves within a limb graft and reintegrating them into a recipient’s nervous system is one of the next challenges that needs to be faced, the experience of patients who have received hand transplants is promising. “In clinical limb transplantation, nerves do grow back into the graft, enabling both motion and sensation, and we have learned that this process is largely guided by the nerve matrix within the graft. We hope in future work to show that the same will apply to bioartificial grafts. The study was supported by a New Innovator Award from the National Institutes of Health. The authors note that more than 1.5 million individuals in the U.S. have lost a limb. Over the past two decades, a number of patients have received donor hand transplants, which also expose recipients to the risks of life-long immunosuppressive therapy. The loss of an extremity is a disastrous injury with tremendous impact on a patient’s life. Current mechanical prostheses are technically highly sophisticated, but only partially replace physiologic function and aesthetic appearance. As a biologic alternative, approximately 70 patients have undergone allogeneic hand transplantation to date worldwide. While outcomes are favorable, risks and side effects of transplantation and long-term immunosuppression pose a significant ethical dilemma. An autologous, bio-artificial graft based on native extracellular matrix and patient derived cells could be produced on demand and would not require immunosuppression after transplantation. To create such a graft, we decellularized rat and primate forearms by detergent perfusion and yielded acellular scaffolds with preserved composite architecture. We then repopulated muscle and vasculature with cells of appropriate phenotypes, and matured the composite tissue in a perfusion bioreactor under electrical stimulation in vitro. After confirmation of composite tissue formation, we transplanted the resulting bio-composite grafts to confirm perfusion in vivo.